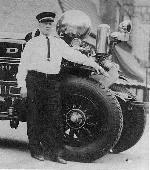 On March 4, 1942, Chicago Fire Department Lieutenant Frank Busch of Engine 91 suffered a fatal heart attack in the line of duty. Funeral services for Busch were held at St. Bartholomew’s Church on March 7, and he was interred at Mount Carmel Cemetery. He was survived by his widow and three children. Obituary of Frank Busch, Chicago Daily Tribune, March 6, 1942.